Tuesday and Thursday evenings come to life with live music at Bar Crudo, a popular hangout that is part of Guy Harvey’s Island Grill. From 7 p.m. to 9 p.m. every Tuesday and Thursday in May, Cayman residents and tourists enjoy the sounds of DJ Cardiac. Happy Hour drink specials get revelers in the mood from 5 p.m. to 7 p.m.
Bar Crudo overlooks the picturesque George Town harbor and offers authentic Caribbean cuisine. The decor features artwork from bar and grill owner, and marine wildlife artist, Dr. Guy Harvey’s private and exclusive collection. Dr. Guy Harvey’s head chef, Indika, is a 2-time Chef of the Year award winner and his passion for cooking shows in the unique and tantalizing menu offerings visitors will get to sample. All dishes on Guy Harvey’s menu reflect his dedication to conservation projects and ingredients are carefully selected to improve long-term ocean stock. Also at Guy Harvey’s, Stogies Cigar Lounge adds an additional ambiance to enjoy on the harbourfront. Stogies features a relaxing environment where guests linger with Cuban cigars and savor beverages from a selection that includes more than 100 exclusive rums, whiskies and fine cognacs. Dr. Guy Harvey has a unique combination of skills and experience, including being a scientist, artist, angler, diver, explorer, conservationist and restaurant/bar owner. He fiercely devotes his life to his love of the sea and his family. His passion for the wonder and beauty of the underwater world drives him to be a leading advocate for the environment and a respected conservationist. 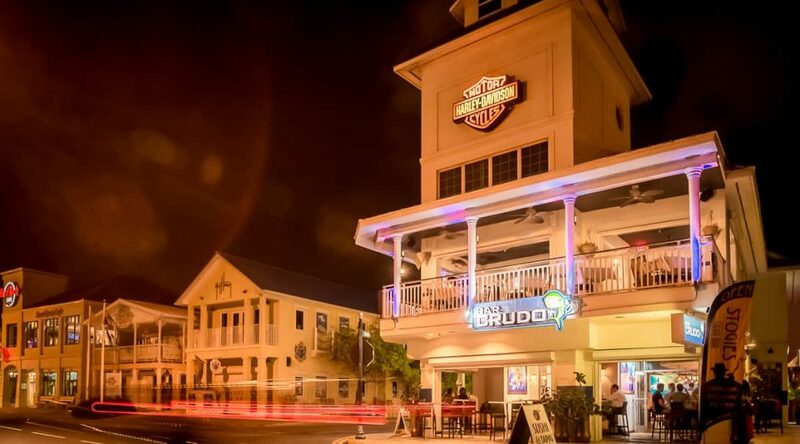 Spend your next Tuesday or Thursday evening, or both nights, in the Cayman Islands at Bar Crudo, Guy Harvey’s Island Grill and Stogies Cigar Lounge. Let the sounds of live music fill your soul and enjoy getting loose to the island beats. Have fun gathering with a diverse crowd that comes together in true island spirit. These weekly events are some of the most special in the Caribbean, and they’re all easily accessible activities from South Bay Beach Club.